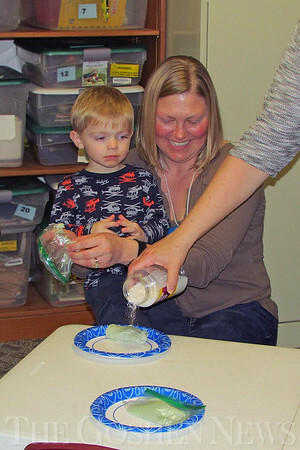 Camden Harney and his mom Heather Harney get ready to make glitter playdough during the Milford Public Library's Preschool Story Time. Children ages three through six are invited to listen to stories, make a craft and share a snack each Wednesday and Thursday through March 11. Call the library at 658-4312 to sign up.